Summary: Find MKV won’t work in FCP(FCP 7, FCP X)? The article shows you the easiest way to import MKV to FCP for editing without problems: just rewrap MKV to ProRes under Mac OS X(Yosemite, Mavericks). Although Final Cut Pro 7 and FCP X offer much wide range video format support than its predecessor, there are still many problems occurred due to the format incompatibility. As one Final Cut Pro user, when you import MKV to FCP, you may find that MKV won’t work in FCP frustratingly. The best method to avoid the issue is to convert MKV to ProRes for FCP, ensuring native editing. UFUWare HD Converter for Mac is a highly-recommended MKV to FCP converting tool for you. It enables you to rewrap .mkv to ProRes for working with Final Cut Pro without loosing quality. Besides Final Cut, this software can also export AIC for iMovie/FCE, DNxHD for Avid Media Composer and more NLE systems. Below is the detailed guide on converting MKV clips to Final Cut Pro friendly videos for smoothly playback and editing. 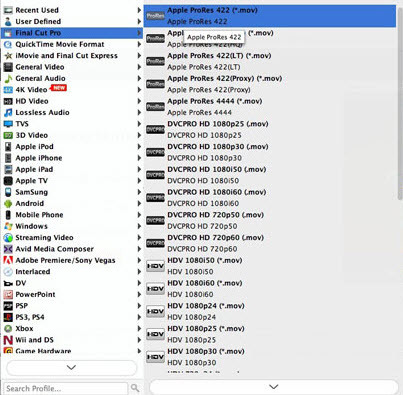 You can directly drag and drop the .mkv files to the software, or click “Add” button to locate the source files into the MKV to ProRes Converter. Tip: If you wanna edit AVI/WMV/MKV files in Final Cut Pro X, FCP 7, this video conversion app is still the great help for you. Press “Format” option and navigate the mouse cursor to choose “Format > Final Cut Pro > Apple ProRes 422 (*.mov)” as the best codec for FCP 6/7 and FCP X on Mac. Tip: Before conversion, you can click the “Settings” icon to customize the video/audio settings: Video Codec, video size, bit rate, frame rate, Audio codec, sample rate, audio channels for Final Cut Pro. Click the big “Convert” button at the bottom right corner; this MKV to FCP converter will start to convert MKV to ProRes for Final Cut Pro immediately. Once the conversion completes, directly import the converted files to FCP, and then you can play, edit MKV files in Final Cut Pro X/7 freely.